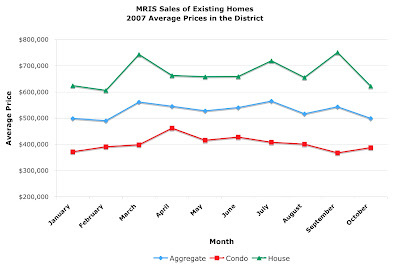 DC Home and Condo Prices: MRIS October Housing Report: Stability? Sales volume. Overall, down 2.52%. 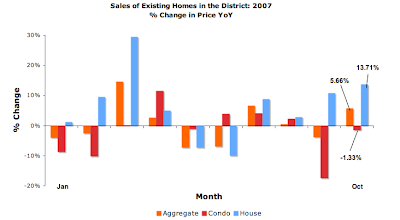 YoY, condo sales volume was up 5.65% and home sales volume dropped 10.16%. Sales volume was mostly negative across the board, the only bright spot being detached homes with 4+ bedrooms, which had a 10% increase in sales volume. Condos represented 52.37% of the units sold. Dollar volume. In aggregate, up 3%. YoY, dollar volume was positive for both condos and homes. 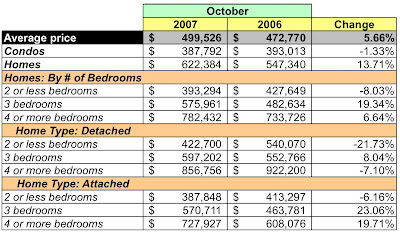 Homes with 2 or fewer bedrooms took it on the chin, experiencing a -44.47% fdecline. Condos constitute 40.66% of the dollar volume. Average sales price. Overall, positive, growing 5.66% YoY. Condos fell 1.33% to $387,792 [despite positive unit sales growth] while homes increased 13.71% YoY to $622,384. Days on market. DOM is 62 days. A closer look shows that more than 60% of all homes sold within 60 days, a performance metric that's been pretty consistent these past few months. Inventory. Based on the month's transaction rates and active listings, there is a 6.83 month supply of condos, a 6.67% drop from September, while home inventories rose to a 8.23 month supply, a decrease of 14.74% from September. Before anyone starts popping the champagne corks, these inventory levels are 65.24% and 57.87% [condos and homes, respectively] higher than August's inventory levels and remain higher than at any point during the year prior to September. Assuming that September's data reflected the August credit and mortgage meltdown, I suppose October's data may indicate that the market has regained its equilibrium, but inventories remain high. Looking at the pricing trends chart [see below], it's beginning to look like prices in 2007 will be flat. At a glance, October's average prices are roughly the same as January's. Although there was no change in transaction volume YoY for attached homes with 4+ bedrooms, their average price grew 19.71%; 8 of 45 sold were sold for more than $1MM.